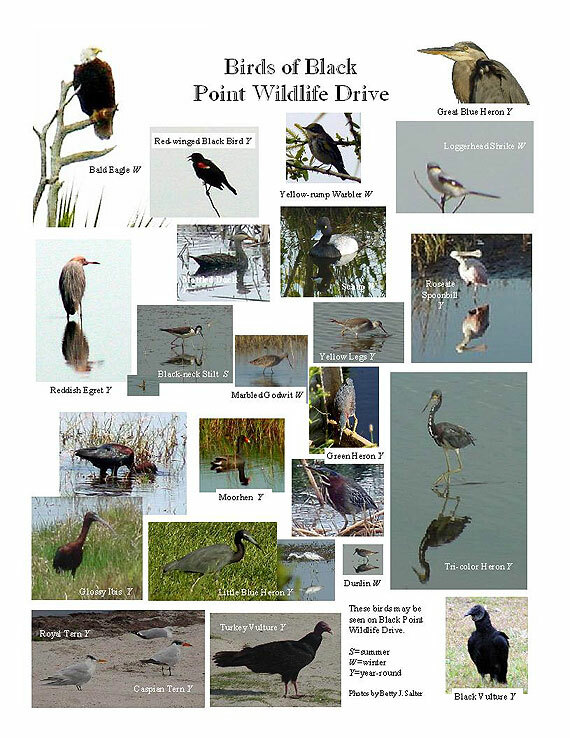 These are small images of birds that you are likely to see on Black Point Drive. They will open in a separate window and you can print them out. They were photographed and compiled by Betty Salter, and we hope you will find them helpful. We hope to whet your appetite with this virtual tour of Black Point Drive. 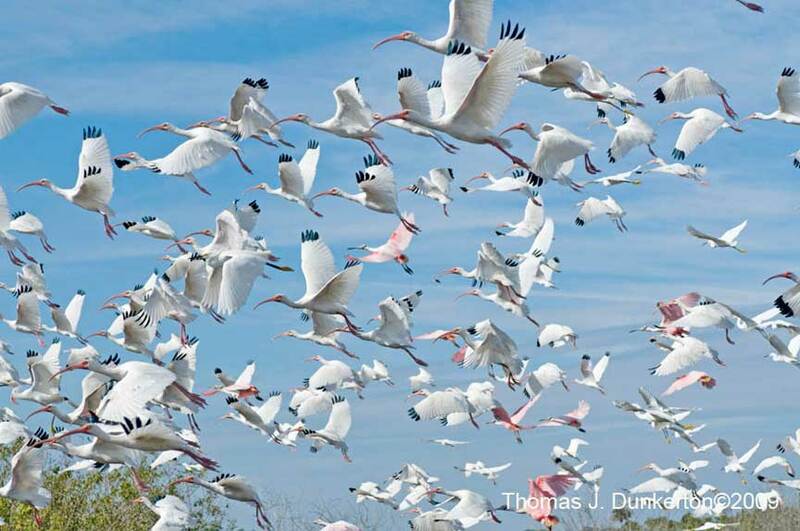 It is one of the nation's most spectacular birding locations. Animals and reptiles are often seen. And, the refuge has set up an enlightening tour. Come, pay us a visit, it is a different experience every day! Entrance Fees are for Black Point Wildlife Drive and for Boat Launching at three improved Boat Ramps within the Refuge (Bairs Cove, Beacon 42, and Bio Lab). 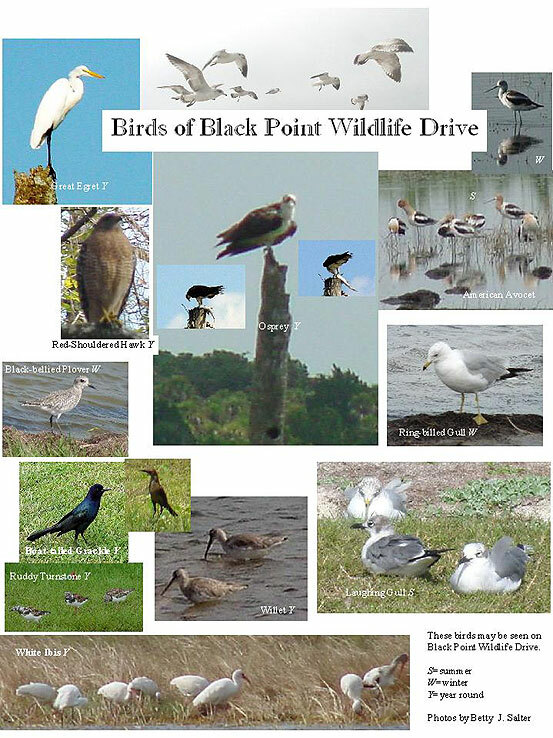 There is a $10.00 daily fee per vehicle for entry into Black Point Wildlife drive and the boat ramps. Yearly passes are available at the Visitor Information Center for $25. Cash or check only. Visitors can pay entrance fees by cash or check at the Visitor Center between 9 am and 4 pm daily or with exact change at the self-pay stations when the Visitor Center is closed. 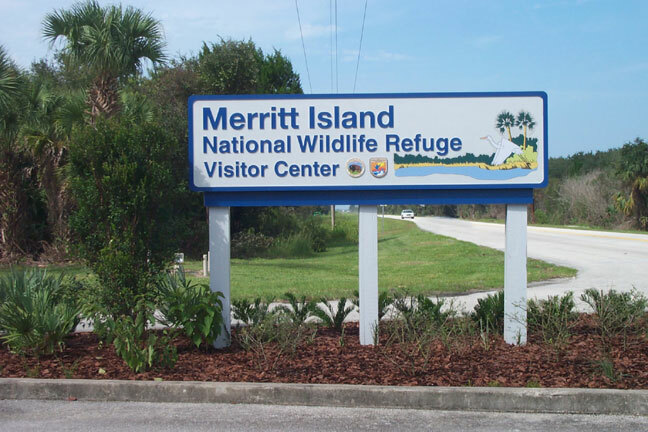 Welcome to Merritt Island National Wildlife Refuge! The seven mile journey you are about to take will provide you views of many of the animals found in the vast marshes and impoundments of the refuge. The one-way road will accommodate large recreational vehicles and ends on S.R. 406. Numbered stops along the drive correspond to numbered paragraphs in this leaflet. Drive slowly (25 mph or less), stop frequently and quietly look and listen. Take along binoculars and wildlife identification guides. Don't concentrate your search just in the open water areas where wildlife is most visible. Also search the mud flats, the edge of dikes, the trees and grass which provide cover, and in the air. Wildlife is accustomed to vehicle traffic on the drive. Getting out of your car to get a closer view or take a picture will probably scare away your subject. You are encouraged to stop, but pull over so others can pass. This five mile foot trail provides a close-up view of the marsh. An observation platform and a photography blind are conveniently located near the parking lot. All or part of the loop trail may be hiked. Imagine a broad, flat expanse of salt marsh stretching from where your car is parked to the Indian River, a distance of about 1 mile. The only obstruction is an occasional hammock of palms or a mangrove-rimmed pond, and behind you, on higher ground, slash pines. Marsh streams gracefully wind through the marsh and provide a thoroughfare for microscopic plants and animals, shellfish and fish. Egrets and herons are poised along the stream edge, like spearfishermen patiently awaiting a meal. Secretively, sparrows search for insects in the chest-high grass. Occasionally, tides aided by a strong wind flood the marsh, and on the ebb, nutrient-laden waters are exported to the river. The marsh and river are one. 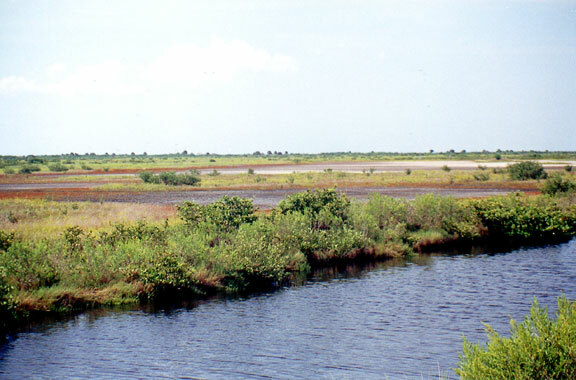 Natural salt marshes such as this have all but disappeared on Florida's east coast, giving way to widespread coastal development. 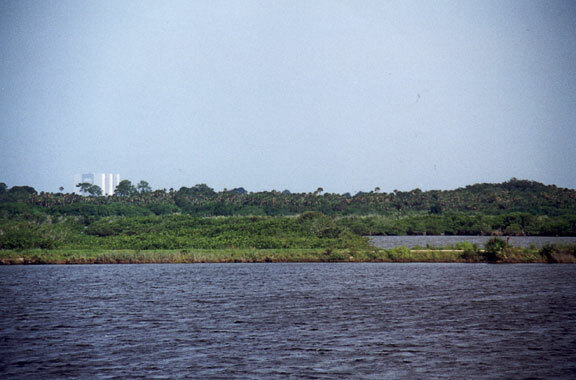 NASA's intervention saved the northern half of Merritt Island from development, but dikes constructed for mosquito control purposes in the 1950's eventually altered most of the salt marshes. Today, an intensive management program developed between the refuge and our local Mosquito Control District has seen the restoration of some of these marshes. Other areas are being managed as shallow water impoundments, which benefit a variety of other animals. Today, the Black Point area attracts more species than ever before and is considered one of the premier birding areas in Florida. Food, water and shelter are the essential ingredients necessary for wildlife survival. When each is found in sufficient quantity and quality, wildlife habitat is formed. But all animals do not share the same habitat. Gray squirrels, for example, live in hardwood forests while cottontail rabbits live in grasslands. Each species has different requirements for food, water, and shelter. 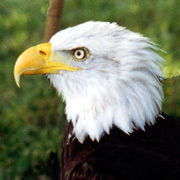 The southern bald eagle has specific habitat needs as well. Bald eagles nest in the old tall pine trees seen to the left, and feed primarily in the marsh where prey is abundant. 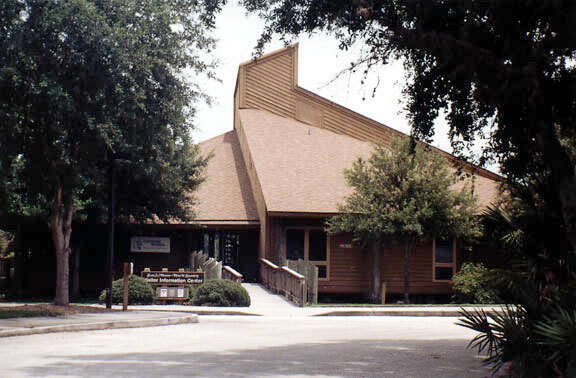 The refuge is managing the pine flatwoods bordering this and other marshlands for the growth of the nest trees, and the marsh for fish and waterfowl, the eagles' preferred food. Since 1973, the bald eagle has been classified as an endangered species. Their population is estimated at 1100 breeding pairs in the lower 48 states, a frightening drop from the thousands which once inhabited our American frontier. Persistent pesticides and loss of Bald Eagle Habitat to residential, agricultural, and industrial development are the primary reasons for this decline. The quality habitat the bald eagle requires is being preserved at Merritt Island and other National Wildlife Refuges. Look through the Nest Finder to spot several eagle nests. 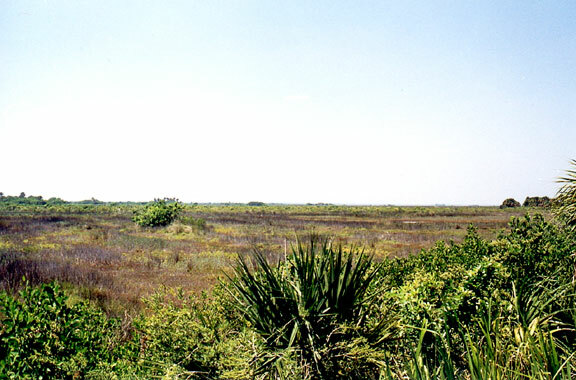 Until the 1950's, natural salt marshes covered much of Merritt Island. The marshes were occasionally flooded by wind tides from the brackish river. The fluctuating water levels of the marshlands were ideal breeding habitat for the salt marsh mosquito. When NASA acquired this land and the local cities began to grow, a more effective mosquito control program was needed. 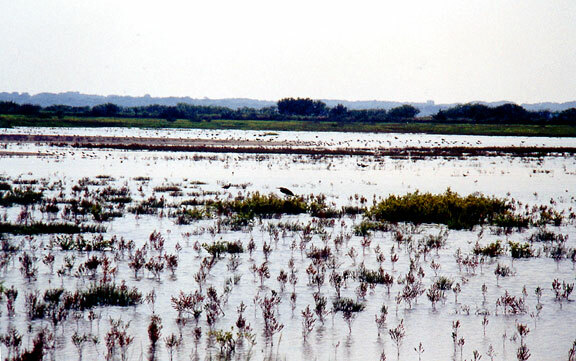 This technique called for impounding water behind a network of dikes, thereby maintaining flooded conditions during the peak mosquito breeding season (May – September). This technique proved to be an effective means of controlling mosquito, but it had adverse effects on the marsh. Eliminating the tidal cycle and maintaining flooded conditions over long periods changed the marsh. Gradually, the salt marsh habitat on your left gave way to the more open shallow water habitat seen ahead. The effect of this change was detrimental to some wildlife, but beneficial to others. 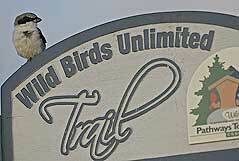 For example, 7 species of birds suffered from this change, 6 were unaffected, and 22 benefited. Was this change for the good or bad for wildlife? The refuge feels both habitat types are important and is attempting to restore the salt marshes in selected locations. From this one spot, what kinds of habitats do you see? From here, you can see a salt marsh, shallow water, mud flats, low palms, and shrubs, and in the distance, palm hammocks and pine flatwoods. Each habitat is important to a different group of animals. This collection of many different habitat types in a small area is called Habitat Diversity, and it is what makes Merritt Island National Wildlife Refuge such an attractive place for more than 500 animal species. Now, think about the area in which you live. Is there as much diversity there, or is most of the habitat the same? Few places have as much habitat diversity as Merritt Island. It is difficult to improve upon the blueprint that nature has provided, but we can manage our lands and waters in ways that increase wildlife diversity and improve the area for wildlife. In your backyard, you can plant a variety of shrubs and trees which provide food (seeds, berries, and nuts), cover, and nest sites for birds and mammals. You could create a small pond, which supplies a water source for many animals and additional habitat for fish, wading birds, ducks and many other wildlife species. The refuge does the same thing, but on a much larger scale. Wildlife managers prescribe controlled burns, which open up certain areas for growth of tender plants, while leaving areas with a thick shrub layer to provide cover. Water levels and salinity are also regulated to create a variety of conditions, which will meet the needs of the different fish, reptiles, birds and mammals that use these areas. Restoring disturbed areas and planting trees are other ways the refuge is improving wildlife diversity. One of the most important ways to manage wildlife is to preserve, improve or create wildlife diversity. Some of the objections to mosquito control impoundments are the changes to the plant and animal communities and the separation of the marsh from the river. A new, more natural, mosquito control technique that is being tried in selected impoundments on Merritt Island is rotary ditching. The impoundment on your left was rotary-ditched in 1981 as a means of restoring the salt marsh. 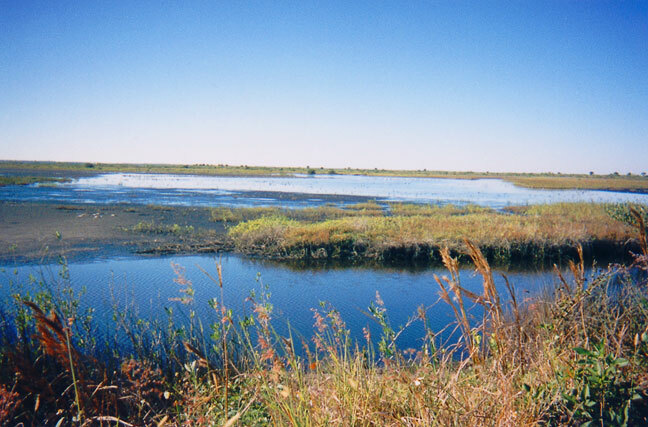 The process involves opening the impoundment to the water level fluctuations of the river and connecting all areas, which may remain wet during low water with a shallow ditch. 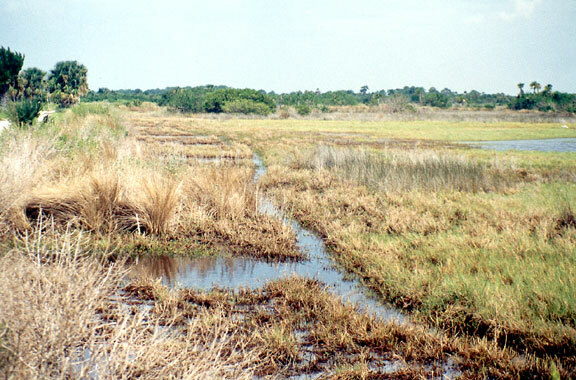 The purpose of the ditch is not to drain the marsh, but to provide fish access to the isolated potholes where most mosquito productions occurs. The fish eat mosquito larvae and become the principle mosquito control agent. But, equally important, the natural water level has been restored, and the marsh will eventually return. Rotary ditching achieves the objectives of mosquito control, and allows the marsh to function more naturally. It is a more natural mosquito control alternative! It's not always easy to achieve both the objectives of good wildlife management and effective mosquito control. The refuge and the local mosquito control district are trying new techniques so that both objectives can be met. The mud flats may not look very appealing to you, but on close inspection you may observe a variety of birds feeding in this area. During low water, the mud flats are teaming with shore birds, which feed on various worms, clams, snails, shrimp or crabs burrowed beneath the soft blanket of moist mud. Most shorebirds feed by sense of touch, using their sensitive bills to probe for and gather food. Overhead, aerial-searching birds, like gulls, terns, and kingfishers, spot their prey visually and dive to capture it in isolated water pockets. Their diet consists mostly of fish stranded by the receding tide. Are the mud flats a yucky place or a smorgasbord of food? It all depends on your perspective. The impoundment on your right, like many impoundments, is managed at a depth of 6 – 18 inches. This water depth benefits the widest range of species and is a highly productive system. Sunlight easily penetrates the shallow water, and submerged plants provide food for waterfowl, shelter for fish, and form the base of the impoundment's food chain. Microorganisms feed on the plants, which are grazed on by one-celled animals, that in turn are eaten by shrimp, small fish, crabs or others. These become food for larger fish that are finally eaten by animals at the top of the food chain, like wading birds, raptors, alligators, and man. Wildlife managers keep the water levels in some of the impoundments high, some low, some salty, some fresh. At certain times, the impoundments are drawn down. It is all part of a management plan to keep the impoundments productive and increase wildlife diversity. The sight and sound of several thousand waterfowl filling the sky and gracefully settling down on a quiet marsh is an experience to savor and remember. Each winter, freezing temperatures force the southward migration of millions of waterfowl, marsh birds, shore birds, raptors, and songbirds. For many species, this journey begins in the tundra region of Alaska, and may end in the tropics of Florida. A typical one-way trip may cover 6,000 miles and could take less than a week if conditions are favorable. The U.S. Fish and Wildlife Service has established a chain of refuges along ancestral migration routes to provide feeding areas, rest stops, and over-wintering grounds for migratory birds. 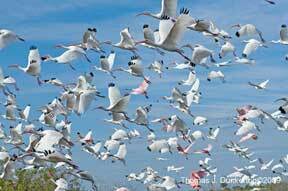 Merritt Island National Wildlife Refuge is but one link in this chain. 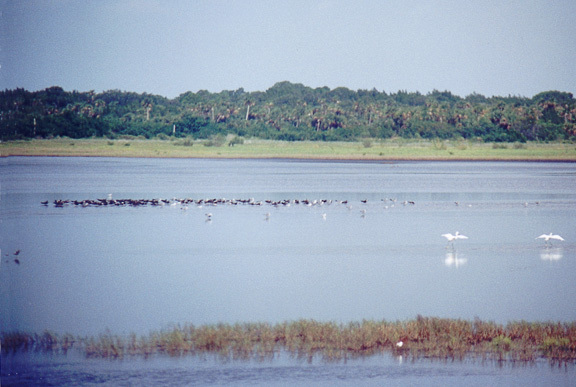 Merritt Island is one of the key wintering areas in Florida and supports winter populations of 50-70,000 ducks, 100,000 coots, 12-14,000 gulls and terns, 2,000 raptors, and an enormous number of songbirds. Look for the arrival of some species as early as September, with peak populations occurring in January or February. The northward migration begins in early March. 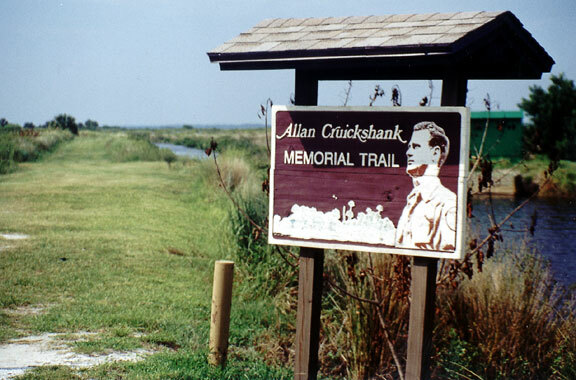 Allan D. Cruickshank was a famous wildlife photographer, writer, and naturalist who was instrumental in the establishment of Merritt Island National Wildlife Refuge. Mr. Cruickshank was a great bird enthusiast who loved visiting this area. A five mile foot trail and study area has been established in his honor. An observation tower is located five minutes from the trail-head parking lot. 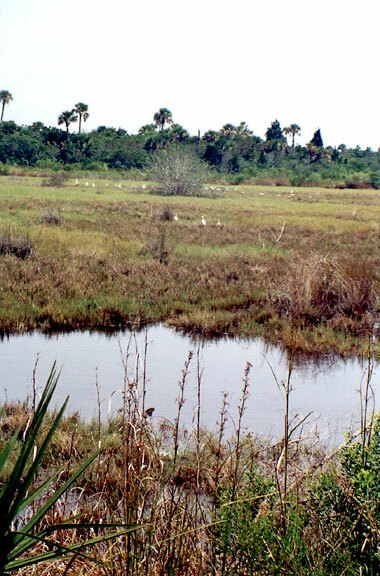 The natural salt marshes of Merritt Island and the St. Johns River west of Titusville, once were home to a non-migratory songbird known as the dusky seaside sparrow. The dusky was not discovered until 1872, and this was the only place in the world they have ever been observed. The dusky seaside sparrow was declared extinct in December, 1990. The dusky's demise began in the 1940's when man began spraying the marshes with DDT for mosquito control. The pesticide entered the birds' food chain, and the dusky population plummeted from 2,000 to 600 breeding pairs. From the mid-1950's to 1963, dikes were constructed to impound the marsh. 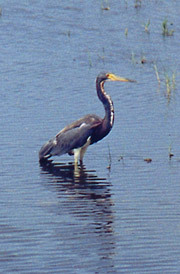 The ground–feeding dusky could not tolerate prolonged periods of flooding, and their population dwindled to 70 pairs. 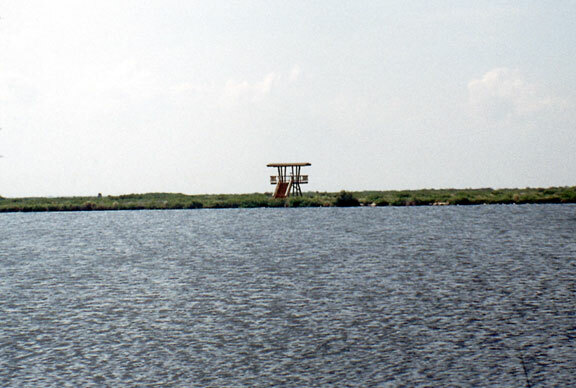 In 1963, the refuge began managing a small portion of NASA's lands including the joint management of the marshes with the mosquito control district. During this era, America was caught up in a "race for space" and any movement to curtail mosquito control was met with resistance. Despite support of the local mosquito control director to do something for the dusky, little was accomplished by the refuge and the downward spiral continued. 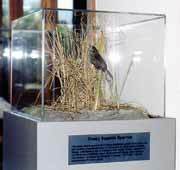 In 1969, with only 35 pairs reported, the refuge began a joint management program with the mosquito control district, which allowed for the removal of three dikes to restore the marsh. The marsh was restored, but the dusky could not recover from the previous habitat disturbance. 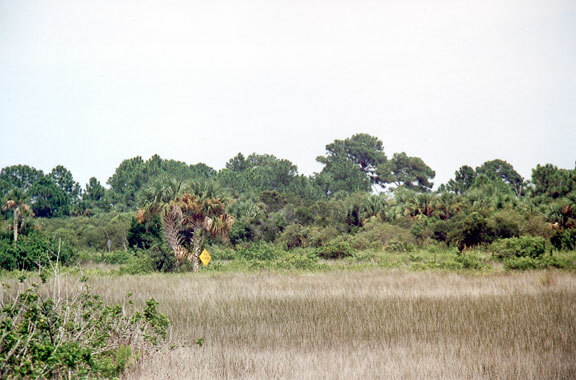 In 1977, biologists observed what was believed to be the last dusky on Merritt Island in the marsh to your left. A separate population on the St. Johns River west of Titusville also succumbed to encroaching civilization. One of the most potent natural forces is fire. Wildfires are part of the natural cycle in this area. 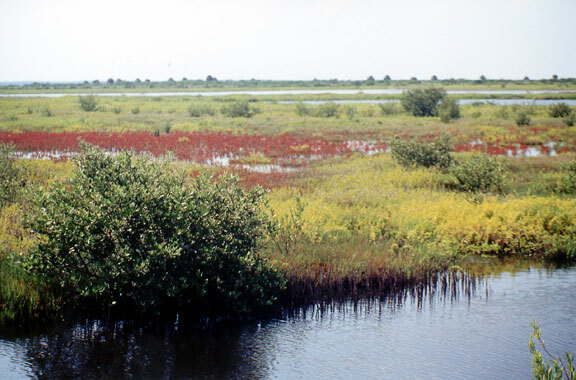 Without fire, the marsh would be taken over by shrubs, and the plant community would change. The same is true for the pinelands. If fires are suppressed, the pines will gradually yield to the shade of the hardwoods. Fire is the principle force, which created the tremendous plant diversity on Merritt Island, and it is one of the best management tools for maintaining it. 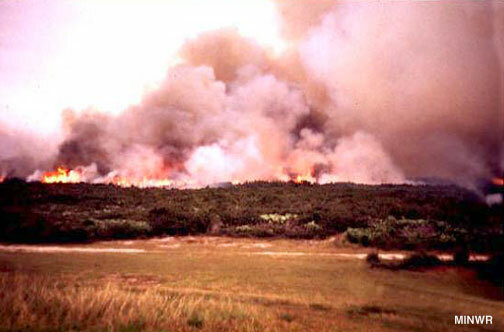 Wildfires caused by lightning burned over one-third of the refuge during the drought years of 1980 and 1981. Because fires had been suppressed for many years, an unnaturally large volume of dead leaves and limbs was available. The fires were particularly intense, killing up to 90% of the pine trees. You can see the effect of these fires on many of the pines in this and other portions of the refuge. The refuge is now conducting controlled burns on a rotation basis. The purpose of the burns is to restore a more natural fire cycle, and the controlled burns are less stressful on plants and animals. Carefully controlled fires are an important management tool and a benefit to wildlife populations. The grassland to your left is probably the way most of the Black Point area looked prior to mosquito control. Through a restoration program, this, and other salt marshes are being brought back to their natural state. 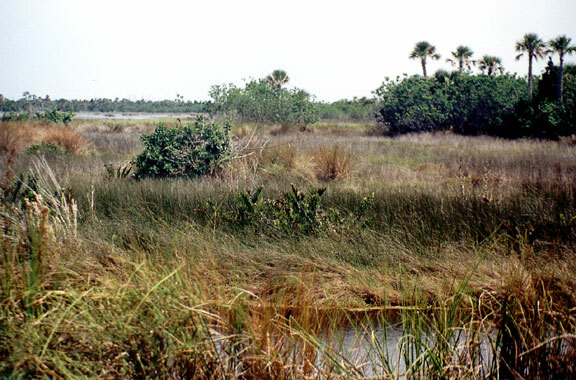 By the time the refuge was established, a series of dikes already surrounded the marshes of Merritt Island, and this unique habitat has started to change. The dikes altered the marsh from an open system, one that had a free exchange with the river, to a closed or an impounded system. Prior to impoundments, the marsh acted as a natural filter for coastal waters, and absorbed the wave energy of storms and protected the upland. The marsh also served as a nursery for juvenile fish and was an important link in the river food chain. After impoundment, these valuables were lost. In 1969, the refuge began removing the dikes on this marsh, and the natural salt marsh is slowly restoring itself. In time, most of the shrubs you see will disappear, and the marsh will be as it once was: an open grassland between the river and land. 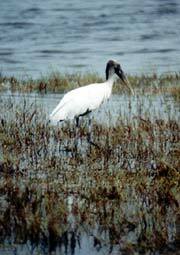 The salt marsh is an important habitat for wildlife. The creatures using the marsh are often secretive and take full advantage of available cover. It takes keen observation to discover many of these species. Compare the wildlife found here with animals of the open water areas behind you. Can you see the value of having both habitats? Thank you for visiting Merritt Island National Wildlife Refuge. We hope you enjoyed the wildlife drive and understand more about the refuge. The needs of wildlife are similar to your own. By providing quality food, water and shelter and managing for habitat diversity, the refuge plays its part in taking care of the needs of wildlife. Wildlife Management is Habitat Management. What sets Merritt Island apart from other National Wildlife Refuges is the unique relationship it shares with NASA. NASA owns the land, but the refuge manages the non-operational areas through an interagancy agreement. In addition, the National Park Service and the Brevard Mosquito Control District also have joint management responsibilities. Obviously, each agency has its particular mission, which is not always directly compatible with wildlife management. However, we have learned that the land can be managed for other uses and still remain productive for wildlife. As we approach the twenty-first century, this may be an important concept upon which to build. Through proper planning and management, man, technology, and nature can co-exist. You are welcome to take this leaflet with you. If you do not want it, please leave it in the box at the end of the drive. Wednesday, May 16, 2018 - 2/12/00.